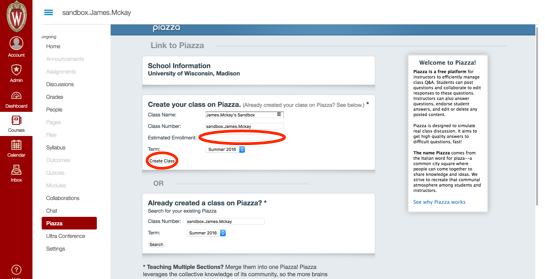 At UW-Madison, the Piazza Q&A product is integrated with the Canvas learning management system. This integration allows direct sign on to Piazza via a link from within Canvas. This document describes how to access Piazza Q&A from Canvas. Students see Launching Piazza Q&A, below. Click on Settings, then select the Navigation tab. At the bottom of the page is a list of tools that are not in the navigation bar. Locate Piazza and drag and drop it into the list of tools directly above. To launch the tool, click on the Piazza link in the Canvas course navigation bar. Instructors will see Piazza Q&A launch. (Note: You do not need to upload your course roster. 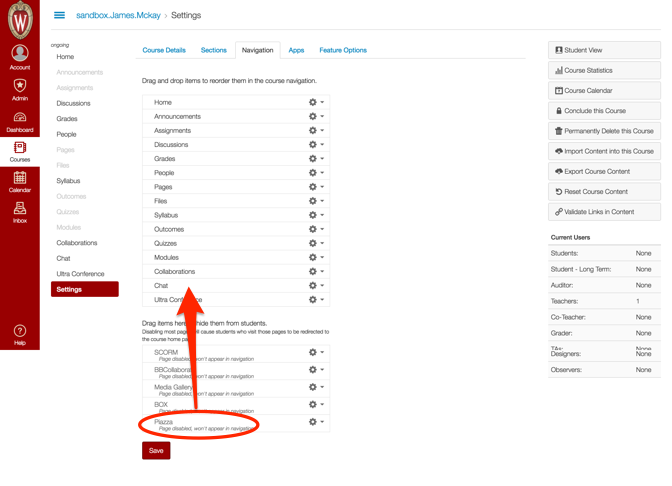 Students will automatically get added to the Piazza roster as they click on the link in your Canvas course. 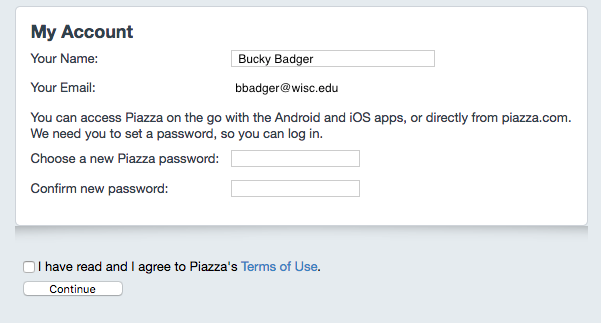 Also, there is the possibility that a UW student not in your course will sign up for your Piazza course. You should periodically go through the roster in Piazza and remove students who are not in your class in order to protect your students FERPA rights). Enter your academic information or click the I'm not pursuing a degree checkbox. 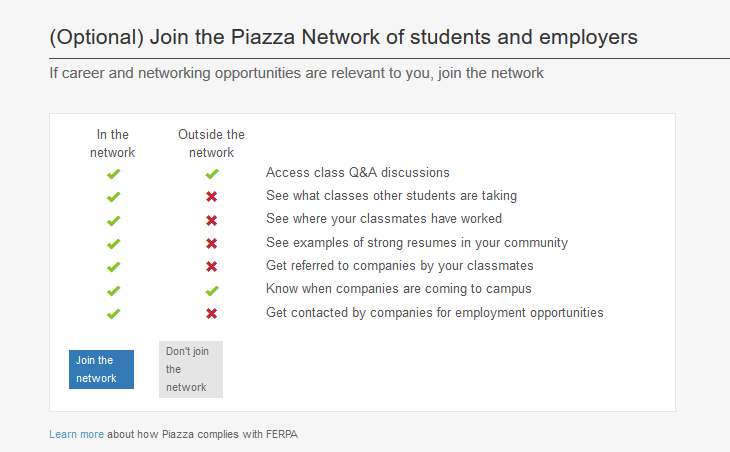 A screen appears, asking you to register for the Piazza Network. Network is a different product offered by Piazza and it IS NOT REQUIRED that you sign up for it. In fact, researching the Network product is highly recommended prior to signing up, as it allows your profile to be viewed by outside organizations. 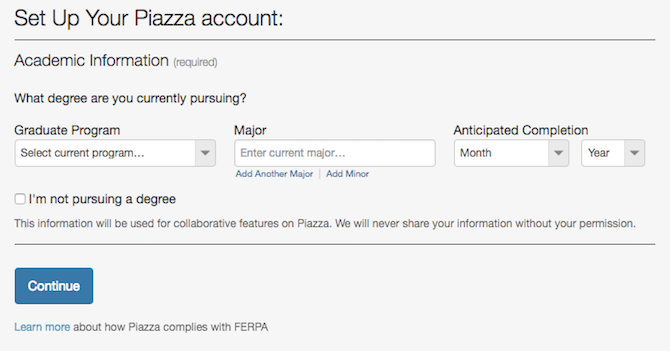 If you choose to join the Piazza Network, you will be asked to agree to terms of service. If not, you will proceed directly to Piazza Q&A. If you are experiencing any difficulties or issues with Piazza Q&A, please contact Piazza support 24/7 at team@piazza.com.